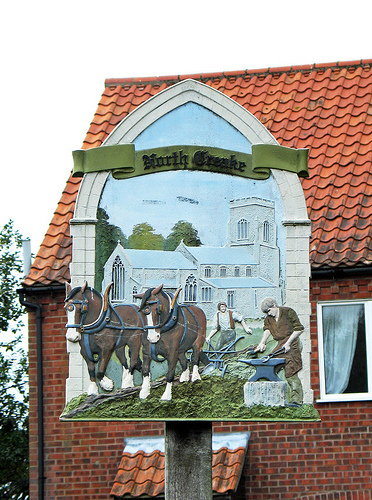 North Creake is a village and civil parish in the north west of the English county of Norfolk. The village lies on the River Burn, which flows through the centre of the village. 1 mile (1.6 km) to the north of the village along the river lies the ruined Creake Abbey. The village itself musters a church, a public house, and a post office. Most of the agricultural land surrounding the village, and many of the village houses, today belong to the estate of the Earl Spencer, who consequently has significant influence on village matters, although his family seat is many miles away in Althorp, Northamptonshire. On April 27, 1944, a De Havilland Mosquito fighter bomber, on a night training exercise, crashed in the centre of the village killing the crew of two. On the 60th anniversary of the crash in 2004, a plaque on the approximate location of the crash was unveiled by an Royal Air Force guard of honour and other dignitaries, including relatives and friends of those killed. Arrq gb znxr n pnyy?